Established in 1985, Specialty Enzymes & Probiotics (Formerly Cal India Foods International) is a leading producer of enzymes in the Western Hemisphere. Specialty Enzymes & Probiotics offers complete enzyme solutions for healthcare and nutrition primarily to North America and Latin America. A subsidiary of Advanced Enzymes USA, the company specializes in creating custom enzyme blends, from conception to finished products, and also offers highly effective established enzyme products. AST Enzymes is a leading manufacturer of professional, enzyme-based strength supplements to support cardiovascular, anti-inflammatory, joint, digestive and colon health. AST Enzymes uses only non-genetically modified, natural ingredients, tested by its team of leading scientists and industry experts. AST Enzymes helps customers achieve a healthy lifestyle with enzyme supplements that are formulated and manufactured in-house, assuring customers of the highest quality, activity, purity and safety. AST Enzymes (Advanced Supplementary Technologies Corporation) is a subsidiary of Advanced Enzymes USA. Advanced EnzyTech Solutions is a leading provider of eco-safe enzyme solutions for industries like textiles, leather, paper, detergents & cleaning aids. Equipped with a dedicated research & development facility, Advanced EnzyTech Solutions Ltd. aims to replace the traditional harsh chemical processes in these industries with newer, eco-friendly, yet cost-effective solutions using enzymes, micro-organisms and bio-degradable chemicals. Launched in 2008, Advanced EnzyTech Solutions is a wholly owned subsidiary of Advanced Enzyme Technologies Ltd. Launched in 2007, Advanced Bio-Agro Tech Ltd. focuses solely on animal nutrition. A subsidiary of Advanced Enzyme Technologies Ltd., the company develops, manufactures and markets enzyme-based solutions for industries such as poultry and cattle. Advanced Bio-Agro Tech Ltd. has established itself as a leader of poultry enzyme solutions within the Indian sub-continent, and offers solutions to the large South East Asian markets of Vietnam, Thailand, Malaysia and Philippines. Enzyme Innovation is a subsidiary of Specialty Enzymes and Biotechnologies, USA focused on marketing and business development of industrial enzymes in Americas. Enzyme Innovations caters to industries like Baking & Milling, Brewing & Malting , Craft Brewing & Distilling, Fruit & Vegetable processing, Animal Feed, Protein Modification, Grain Alcohol, Paper & Pulp, Waste Management, Wine and Detergents & Cleaning aids. The company specializes in customized solutions. Brief - Dynamic Enzymes, Inc. (―DEI‖) was incorporated on February 24, 2015 under the laws of the State of California with its registered office at 4880, Murietta St., Ste. D, Chino, California 91710 since incorporation. DEI, inter alia, offers high quality systemic and digestive enzyme supplements through retail channels. JC Biotech was established in the year 2004 with the objective of manufacturing nutraceuticals, bio-pharmaceuticals and bio-chemicals. Effective 1st December,2016, JC Biotech has become a subsidiary of Advanced Enzyme Technologies Ltd. Apart from continued development and manufacturing of bio-pharmaceutical molecules, JC Biotech also aspires to produce algae DHA in the near future. 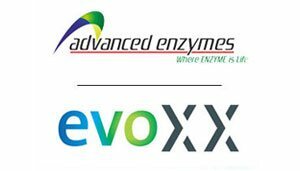 evoxx technologies is an industrial biotech company focusing on the development and production of industrial enzymes and development of oligosaccharides and polysaccharides to be primarily used in food applications. We are specifically targeting ingredients that offer consumer health benefits. evoxx has a team of about 40 scientists and technicians and two sites in Germany, Monheim am Rhein and Potsdam.